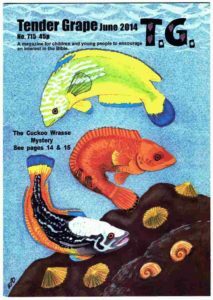 Ever since The Little Gleaner had ceased publication in the later forties I had been deeply exercised about the lack of anything spiritual for our children to read. We had a large Sunday School at Knaphill which met for about an hour, but it was a pitifully short time to teach these children each week, and then we did not see them until the next Sunday. I wanted to bridge that gap by giving them something to take home to read. At first we started with a weekly news sheet that gave chapel and Sunday School announcements and children’s birthdays. About this time I had gone to a Nursery School Association meeting in Lon don when the speaker had asked for volunteers to read and evaluate comics to stay behind after the meeting. This was the time when station bookstalls were being flooded with comics from America of very poor standard. They were not really intended for children at all but because of their familiar format children were getting hold of them. They were crude, blood-thirsty cartoon-type papers, full of sexual innuendo and perversion. The Government was being asked to do something about them and a Royal Commission was set up. I had a nursery class at the time and had already taken some of these comics away from children in my class, so I felt I ought to volunteer. No one else seemed to approach the speaker, so for one long year every month a large roll of comics of every shape and size with a wad of report forms came through the post. They each had to be read and appraised and then sent on to the next person in the team. It was soul destroying, horrifying work. I was personally appalled by the very low standard of writing in even those comics regarded as sound. Surely there must be something better one could put in front of our children. My resolve to do something was growing but I had no idea how you set about it. Then in October 1954 our superintendent decided to add a letter to the news sheet, and he asked me if I would write a Bible story for the youngest children. I agreed as long as I could write three articles, one for the little ones with a picture to colour, one for the juniors and one for the seniors. Our superintendent was not really in agreement with a woman taking responsibility for this work, but when he came to prepare the material I had submitted, he felt convinced this was something the Lord had given me to do, and he must do what he could to help me. He called me into the vestry before the Tuesday evening service and told me he would use the three articles as No. 1 of The Tender Grape. My father had suggested the name and that was confirmed that very evening when Mr. Stanley Delves gave out his text: MaIachi 3:10 and 11. That last verse ends, “Neither shall your vine cast her fruit before the time in the field,” saith the Lord. The following weekend we ran off 150 copies. As I cycled to school on Monday morning I talked to the Lord about the many unresolved problems. We had hastily decided to charge 6d a copy. The Little Gleaner had been 4d. Would that be enough? Ought we to charge at all? I knew my parents wouldn’t let me starve if I put all my money into the magazine, but was that fair? Perhaps the Lord intended it to be a bigger work than I could finance. When my father came home from work that evening, he was surprised I had not picked up a pound note on the piano. That very morning he had given a friend a copy of the magazine and he had immediately given my father that note towards the work. The Lord was already answering all the questions I had been asking that morning. This same friend had been to see several people he thought would be interested and had collected £7.50 with promises that the nine donors would give that amount every month until The Tender Grape was on its feet. Actually, they all continued to subscribe until the Lord called them home, gradually increasing their gifts over the years. Before that first month was out we had to print another 150 copies and by December 1st I had orders for 360 copies. By the end of the first year we were selling 600 every month. It had become too big a job for home production so we used a duplicating business in Woking to make up the books for the next five years. In 1961 we turned to a printer as we needed a run of 1200 copies. We had up to 300 children answering our Bible Searching questions. The magazine was filling a need among Baptists, Anglicans and Presbyterians. 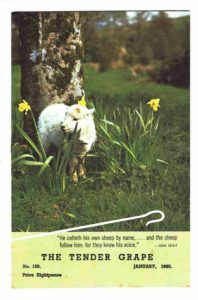 Printing meant we needed to decide on a cover and I was beginning discussions with the printer when, out of the blue, a Bible Lands Society catalogue landed on my doormat, offering six full colour covers which could be over printed of lovely Bible Land scenes. I went to see the secretary, the late Mr. C.L.Clothier at High Wycombe, who said that as a Christian publication he could see no reason why we couldn’t come under the terms of the Bible Lands Trust and have a special price, so our new look Tender Grape was launched. Another person who took a particularly helpful interest in The Tender Grape in its early days was the late Mr Geoffrey Williams, who made suggestions, lent me books and encouraged me in every way he could to continue. He found me many new subscribers over the years and did his utmost to promote The Tender Grape. We also began another scheme to supply free parcels of unsold copies to mission stations around the world. The Trinitarian Bible Society gave me a few addresses, but we now have about thirty addresses. Some have a parcel every month, others every other month, others every four months. Postage for this side of the work amounts to about £40 a month, but these copies are among those most appreciated by the recipients, who annually write begging me not to cut them off my list. submitting puzzles at first but she now writes two articles every month as well, and she has found a friend to do her illustrations. From Issue no.2 I have had the loyal support of my long-suffering brother illustrating my articles, often at very short notice. Another teacher joined the team and at one time we had two retired missionaries writing for us but sadly for us they have died. Another gentleman who prepared the pages for the printer for a time still writes for us. A team of four young people have recently taken over that side of the work, and there is another loyal team who prepare labels, label envelopes and help with dispatch. The Lord has been very good. He graciously continues to give ideas for articles. I have the whole-hearted support of my church and many, many friends who regularly pray and give to the work. What is more, the Lord has given me this to do, which I thoroughly enjoy. In 43 years we have only missed one issue, when a few days in hospital coincided with a postal strike.